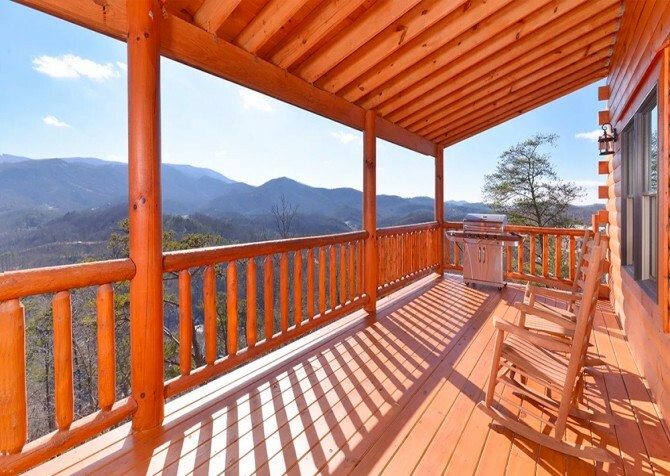 Escape to the beauty of the Smoky Mountains in style in this gorgeous 3,700-square-foot log cabin nestled among the trees of the Smoky Mountains. Great for couples’ retreats, bridal party getaways, and multi-family vacations, this impressive 4-bedroom lodge boasts an indoor pool, air hockey, pool table, and an outdoor hot tub for a fun and relaxing stay in between trips to downtown Pigeon Forge. After whitewater rafting down the Pigeon River, ziplining through the trees, and hiking through the Great Smoky Mountains National Park, guests can unwind in the cozy bedrooms with 3 kings and 2 queen-size beds, flatscreen TVs in every bedroom, full bathroom access within close proximity, and closet space to unpack suitcases. 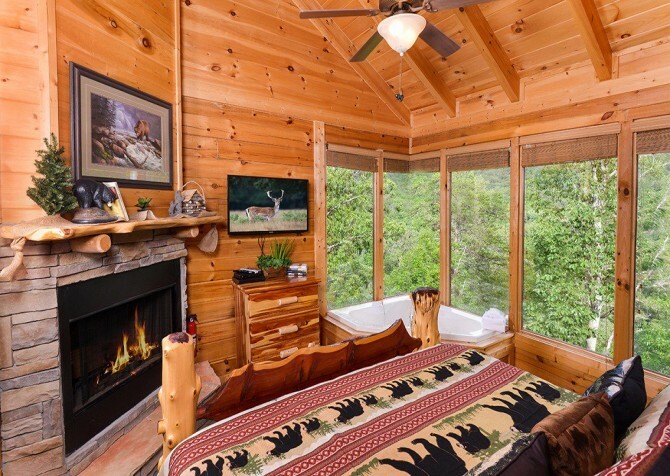 In the mornings, wake up to beautiful wooded views before heading to the fully loaded kitchen to brew a fresh pot of coffee to enjoy by the outdoor fireplace on the back deck. 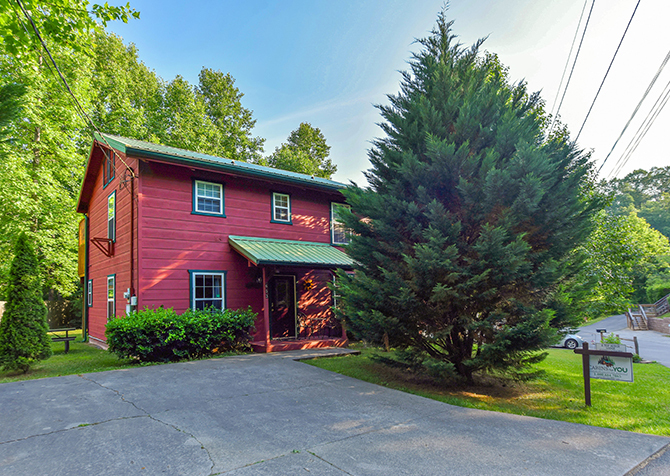 Enjoy the conveniences of home, like a washer and dryer to clean clothes after hiking and wireless internet to upload family pics to social media, for an all-around comfortable and entertaining stay in the beautiful Smoky Mountains. High vaulted ceilings with exposed beams and an enormous windowed wall crown this majestic cabin, allowing dreamy natural lighting to brighten up the gorgeous interiors of varied polished and aged wood. Settle in around the gas fireplace on the 3 large, plush leather couches before playing group games like charades, while tables around the room provide space for drinks and snacks. Mounted on the impressive stacked-stone fireplace, turn on the large flatscreen TV while hanging out with friends and family. Drift off into a nice afternoon nap or finish the last couple chapters of a book on the sofas in the warm sunlight passing through the windows in between excursions to Pigeon Forge. Spacious countertops, plenty of cooking tools, and stainless-steel appliances make cooking large meals for the group more than possible. The large island and breakfast bar combo lend the perfect area to clean and chop vegetables for an appetizer platter when the aroma of the main courses draw in hungry mouths. Even with 14 guests, there is plenty of room in the full-size, side-by-side refrigerator to store leftovers from The Old Mill and treats from The Fudgery. 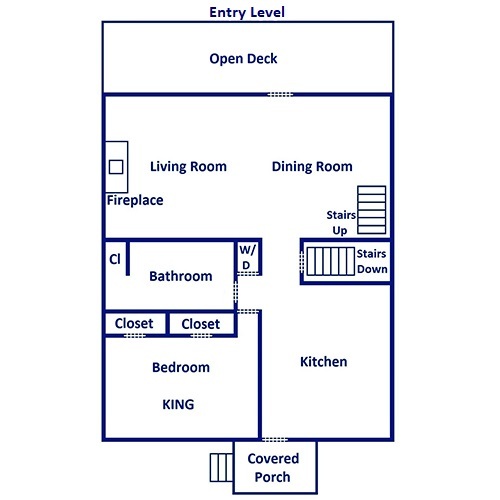 Guests can quickly reheat leftover lunches in the microwave before sitting down at the high-top breakfast bar to enjoy. The gorgeous dining room set provides a lovely space to toast to catching up with friends, family holiday gatherings, and brides-to-be. Light the fire in the adjacent living room to set the mountain-cabin ambiance as the beautiful array of colors over the mountains rest in sight at dusk. After dinner, clear the table and unpack your favorite board games from home to keep the good times and laughs going late into the evening. 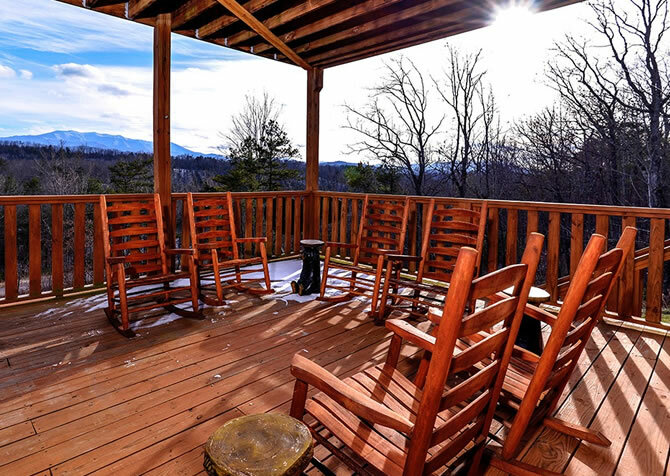 In the mornings, dig into a hearty pancake breakfast while enjoying the early mountain views through the large windows in anticipation of your scenic tour of Cades Cove in the Great Smoky Mountains National Park. Warm cabin atmospheres, homey furnishings, and convenient touches like bedside tables to leave charging cell phones and closet space to unpack provide guests with a relaxing space to unwind after exciting days in Pigeon Forge. The entry level’s bedroom boasts a king-size bed and a large indoor jetted tub in the nearby bathroom for soothing soaks before heading off to bed for the night. 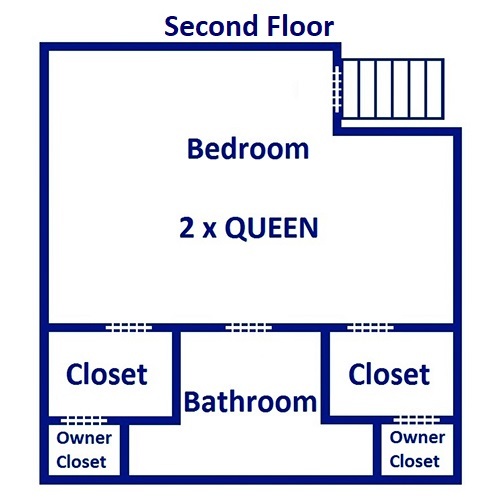 There are 2 more bedrooms with king-size beds, while the upper level’s bedroom is perfect for younger guests to share, providing 2 queen beds and an awesome air-hockey table. Enjoy private TV viewing with each bedroom’s flatscreen during cabin downtime before meeting in the living room to organize the next fun group outing. 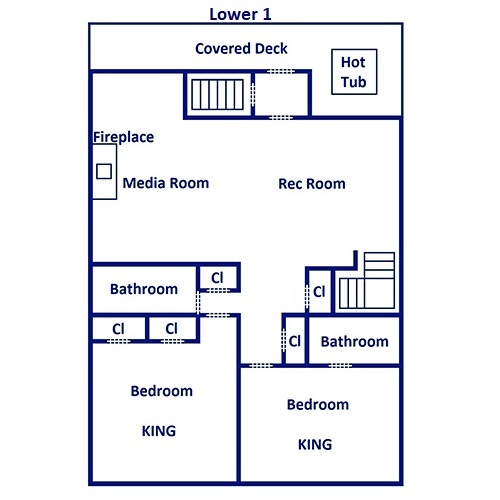 Bring your drinks to the wet bar and enjoy a full evening of fun in the lower level’s rec room! Share a growler of your favorite beer from the Smoky Mountain Brewery while playing pool and hanging out at the high-top seating for a private pool-hall experience without having to pay for every game. Skip the expensive theaters and settle into the reclining leather seating with individual cup holders to host a screening on the big screen TV with a warm fire burning in the stone fireplace. During cabin downtime, teach the kids how to play the classic games on the authentic arcade system before sinking into the plush reading chair to peruse Cabin for YOU’s blog to inspire the next adventure in the Smokies. Kids and adults will love this sweet hangout spot! 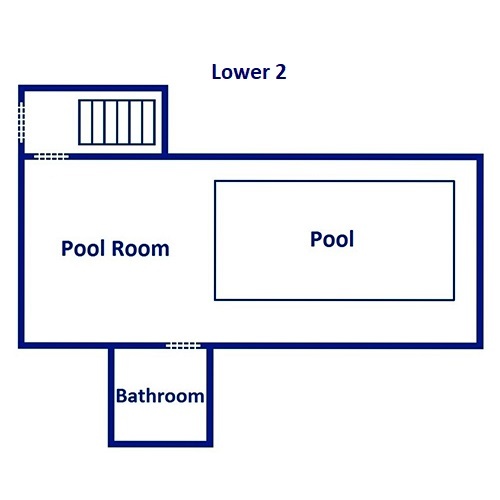 Let the kids splash and play in the 15’x8’ heated indoor pool while parents sip on cold drinks at the high-top seating. Never miss a moment of the big game while enjoying a relaxing dip with the large flatscreen TV mounted on the wall of stylish repurposed wood. Forgot your towel? No need to run back to your bedroom; towels are conveniently provided along with drying racks and a laundry hamper. Savor every laid-back moment while sipping on freshly brewed coffee by the outdoor fireplace and gazing across miles of majestic mountain views each morning. Fire up the gas grill and let the hamburgers and hot dogs sizzle while you enjoy beers with the guys in the nearby rocking chairs. On the lower level’s deck, slip into the soothing, steamy waters of the outdoor hot tub to unwind after an exhilarating trip to Flyaway Indoor Skydiving or begin each morning with bubbling soak and tranquil morning views of the Smoky Mountain forestry. Bringing multiple cars? The flat, paved pull-through driveway makes parking and unpacking much easier on everyone. Take an adrenaline-pumping tour through the tree-tops with Smoky Mountain Ziplines where kids, teens, and adults will love flying through the air on a number of tours to fit any budget! Only 2 miles from the Parkway, easily grab some dinner after working up quite the appetite! So much more than the already awesome wax museum full of life-like famous faces, a trip to the Hollywood Wax Museum can include a zombie shooter game, Outbreak: Dread the Undead, a test of your wit in Hannah’s Maze of Mirrors, and the Castle of Chaos 5D Adventure! Open year-round, zorbing is all the rage in New Zealand! Bounce down a 1,000’ hill in a giant ball filled with water in the summers or go ‘dry’ in the cooler months! Parents can even ride with a child or race one another in separate bouncy orbs to the bottom.